This image (from The Guardian) shows a vulture that has died from eating dead cattle that had been administered the anit-inflamatory drug Diclofenac. This livestock drug has caused the collapse of vulture populations throughout South East Asia. They say that India is a country of paradoxes, and I would have to agree. In no other place have I seen so much beauty and filth, joy and sorrow, opulence and decay, chaos and grace exist simultaneously in the cacophony of old and new that is modern India. The topic of this post joins the list of India’s baffling paradoxes and is one of the most bizarre and tragic things I have come across regarding cattle in India’s modern culture. The pharmaceutical drug diclofenac, an anti-inflammatory medication, has been responsible for driving India’s vulture population to the brink of extinction. Diclofenac has been used to ease the pain of arthritis in livestock and humans but is also highly lethal to vultures that eat the carrion of dead livestock. Studies have shown that a dead cow needs to be fed only 10% of the recommended dose for the toxins present in its carcass to be fatal to vultures. 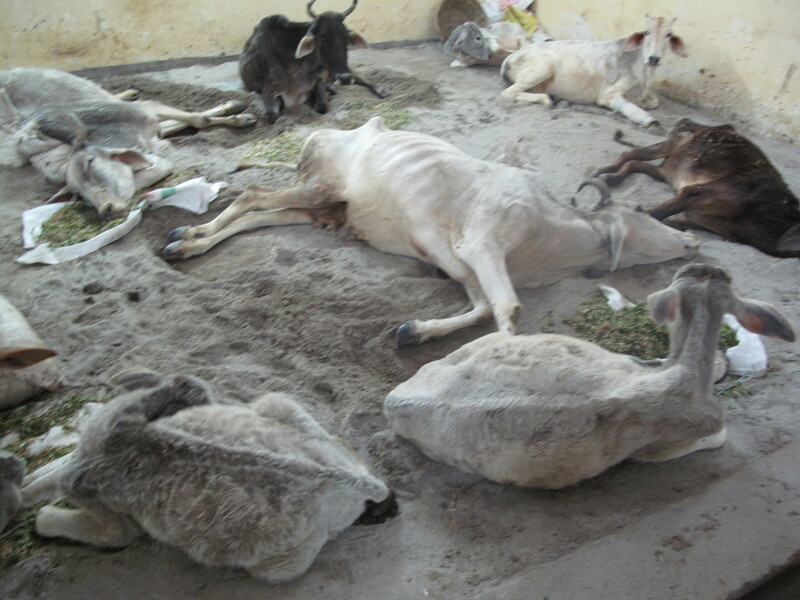 These sick and dying cows are at a Gaushala (cow sanctuary) in Mathura, Uttar Pradesh are likely candidates for Diclofenac, which eases pain and treats fevers in livestock. After a cow dies, it’s skin is removed and hundreds of vultures picked the body clean. This job is now left to feral dogs, rats, or other scavengers. To understand how serious this problem is consider these statistics from the website British Birds. “A study published in 2007 showed that the population of White-backed Vultures in India had dropped by an average of more than 40% every year between 2000 and 2007. Once one of the commonest species in the world, the population has crashed by 99.9% since, from tens of millions to around only 11,000 individuals. 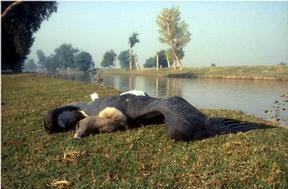 Populations of Long-billed G. indicus and Slender-billed Vultures G. tenuirostris have fallen by 97%. Long-billed Vultures are now thought to number about 45,000 and Slender-billed Vultures just 1,000. The IUCN classifies all three species as Critically Endangered.” The loss of vultures became apparent in the late nineties when villagers began to notice that flocks of vultures no longer dropped from the skies to clean the carcasses of their deceased livestock. Flocks of vultures used to dispose of cattle carcasses in less than an hour. Parsi, a religious group in India also known as Zoroastrians, noticed the birds missing from their burial piers. Parsis do not bury their dead, but leave the bodies on stone piers where birds pick the bones clean. The elements earth, water, air, and fire are considered sacred to Zoroastrians. For that reason their religion forbids them from burying or cremating their dead. They also believe that these “sky burials” help liberate the souls of the deceased. In Mumbai, where the largest number of Parsis live, there have not been enough birds visiting the Tower of Silence to pick the bodies clean for several years. Before diclofenac there were so many vultures that it took less than an hour to perform the ritual. They have since installed solar panels on the Tower of Silence to help decompose the bodies. This issue has caused deep divides the Parsi community, many of whom don’t want their bodies to rot at the sacred site. Crows and kites come to the temple as well, but it is so rare to see a vulture that they have considered enclosing captive vultures in the tower, though this too has generated controversy about the sacred nature of these burials. 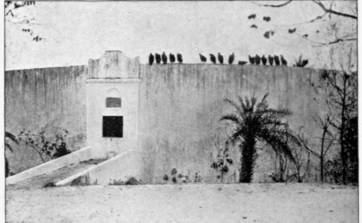 Once upon a time… Vultures at the Tower of Silence. Initially researchers thought the birds had a virus that caused kidney degeneration. Once the kidneys failed the birds died of visceral gout. Soon after it was discovered that diclofenac, which is safe for human consumption, was highly toxic to these birds that routinely feed from dead livestock. Farmers use diclofenac as an anti-inflamitory and pain killer for their cattle, especially with elderly or dying cows and oxen. Because it is illegal to slaughter cattle and many cattle work until the ends of their lives, was an affordable way for farmers to keep their livestock more productive and in less pain until their last days. A course of diclofenac can be administered for less than a dollar. Meloxicam, another anti inflammatory medication, can now be purchased for a price comparable to diclofenac – though it has taken a few years for the price to go down. India’s government made it illegal to use diclofenac for livestock in 2006, yet pharmaceutical companies continue to sell large bottles of diclofenac, encouraging pharmacists to continue the sell the drug for large animals. A recent study showed that the ban on diclofenac is slowing the death of vultures from a 40% population decline every year to 18% mortality, which is still extremely high considering the dismal population of remaining vultures. One study shows that malaria may also be causing vulture death. Captive breeding programs have been started in various places in India, but raising vultures in captivity is not simple. Pairs mate for life and lay one egg a year. It takes four years for a vulture to reach sexual maturity. These challenging statistics caused one scientist to remark that vultures would not reach their former numbers during our lifetime. At least the Peregrine Fund has had reasonable success breeding vultures and their cousins the California Condor in captivity and can aid India in efforts to save its vulture species. Though with only around 350 California Condors alive in the United States, this is not a heart warming figure. Conservation organizations in India can rely on The Peregrin Fund’s success breeding California Condors in captivity. 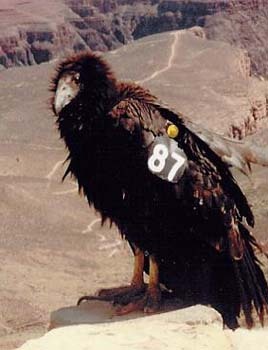 Pictured here a juvenile California Condor. From a Western perspective, India’s ban on cow slaughter may seem antiquated or irresponsible. Questions like, “Why keep cows or oxen around for so long in the first place?” And, “aren’t people in India being negligent by letting cattle live out their natural lives when famine or hunger is a very real problem for many of India’s villagers?” Though these questions may be sincere or sympathetic, they reveal a lack of understanding about the importance that cattle play in people’s lives. Cattle are still used as labor to pull carts or plow fields, and their manure provides cooking fuel, building material, and compost. A live cow is rarely useless, even if she is barren and no longer giving milk. 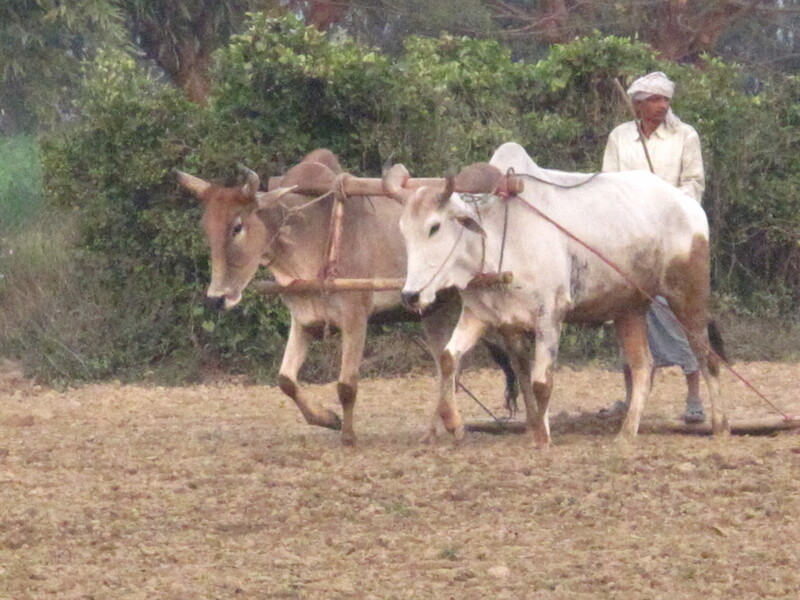 Unlike in Western countries, farmers rarely grow grain for native breeds of cattle, though cattle feed and supplements are becoming increasingly common for the less hearty Western breeds of cattle or crossbred cows that are not adapted to conditions in India. Native cattle can survive on the bi-products of farming like rice stalk hay and cooking scraps, as well the forage growing along roadsides and abandoned lots. 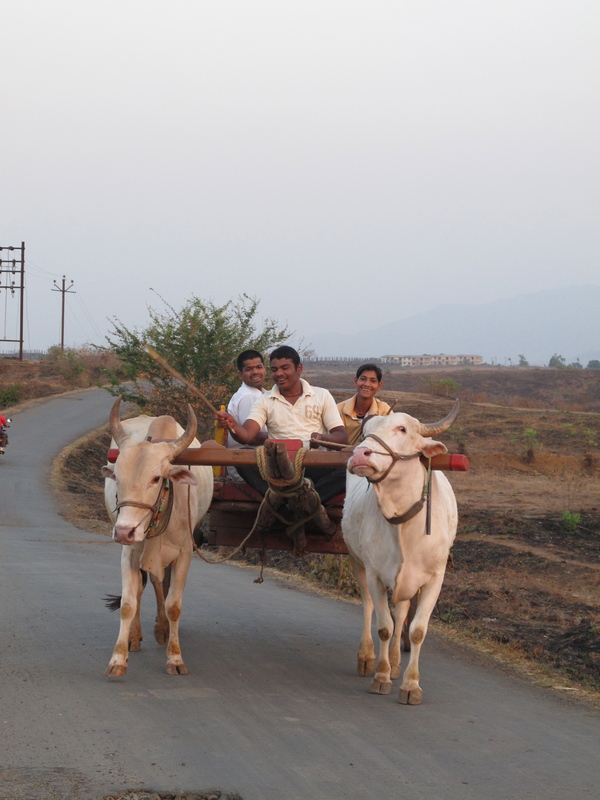 Millions of farmers in India still use oxen for transport or plowing. These guys were nice enough to give a friend and I a ride. From the experience I learned this age old form of transport is extremely bumpy. Anthropologist Marvin Harris, the author of Cows, Pigs, Wars, and Witches: The Riddles of Culture argues that cattle are almost always worth more to villagers than the short term benefits their meat would provide. If a cow survives a drought or famine there is always the potential that she would provide milk again. If killed, her services are lost and there may not be the resources to buy another cow. 70% of India’s population resides in rural areas, most making their livelihood as farmers. Though some things have changed since the 1970’s, when this book was published, cattle still play a significant role in rural life and are valuable to farmers even into old age. It is unfortunate to see a drug that improved the welfare of aging cattle has caused this shocking and sad decline to one of India’s keystone species. Farmers with small plots or rice paddies still do things the old fashioned way. Many are also concerned about public health problems that may follow in the wake of the vultures’ demise. 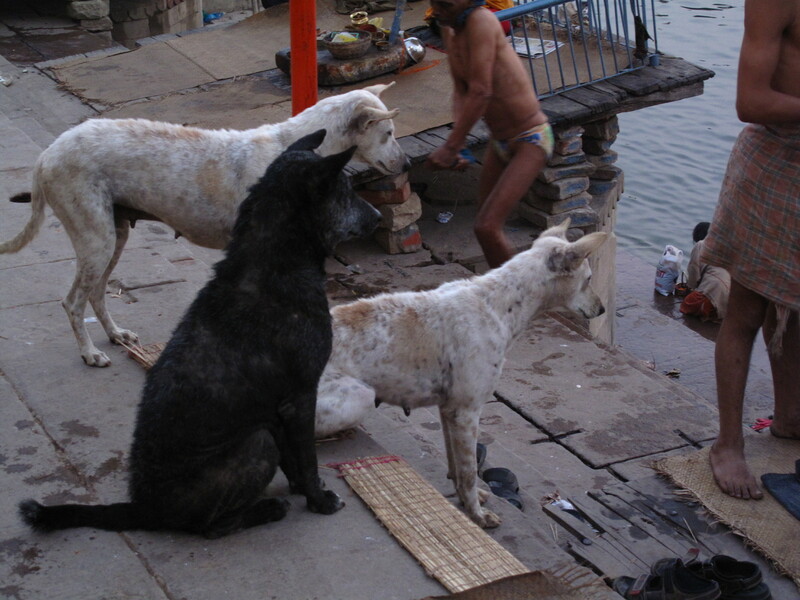 Populations of feral dogs, another scavenger, have increased with the unlimited food suply. Feral dog bites are the main cause of rabies in humans and some worry that the loss of vultures will mean that more people will come into contact with feral dogs. Others worry that fresh water could be affected by rotting carcasses that are not disposed of properly. Environmentalists are also concerned about the increase in population of other forest scavengers and what their presence might do to fragile wildlife populations. The long term affects of the vulture crisis is still unknown. India is not the only country that has lost vultures due to diclofenac. Its neighboring countries of Bangladesh, Pakistan, and Nepal have seen populations of their vultures plummet, as well as Cambodia, Malaysia, and Singapore. 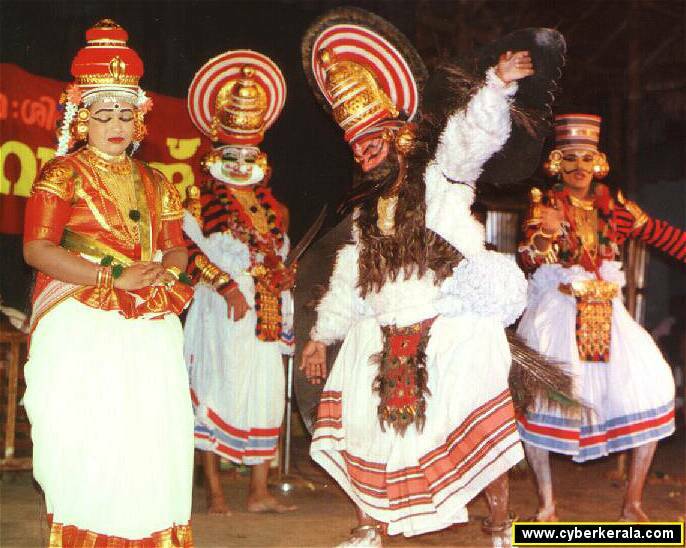 This dancer in Kerala is dressed as the demi-god Jatayu, who died while trying to rescue Rama’s wife who was imprisoned in Sri Lanka. Rama cremated him and liberated his soul. Historically vultures have been revered as symbols of re-birth and balance. They are one creature that never kills its prey, but eats only what has already died, which is viewed as a symbol of ahimsa, the principle to “do no harm”, that many Hindus and Jains subscribe to. Vultures also figure into the vast cast of characters in Hindu mythology. 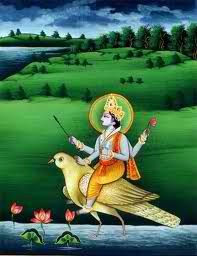 Vishnu’s vehicle is Guarda, a demi-god that is half man and half eagle or vulture. Guarda’s son Jayatu, was a mythological vulture who is represented by the folk dancer in the photo above. There is a shrine being built to Jayatu on a mountain in Kerala that will one day be the largest functioning statue in the world, complete with a 4-D movie theater and visitor center inside. To see the proposed plans for this stunning shrine click here. With vulture populations continuing to decline at 18% a year, it is a very real possibility that if they became extinct vultures could join the other gods as mythological creatures that bestow their blessings in spirit only. Shani or Sani, the Hindu god associated with the planet Saturn in Hindu astrology is sometimes pictured with a vulture as his vehicle or is pulled in a chariot by one. To my readers in India, please help vultures by stopping the use of diclofenac in India. If you are a veterinarian, please stop the illegal sale of diclofenac and encourage pharmacists to sell meloxicam to farmers instead. Even though the efforts to save the vultures require the cooperation of many at least the source of the problem is known. There remain mysteries on other continents about new recent massive species die offs like white nose syndrome in brown bats in the United States and colony collapse in honey bees, both of which have not been linked to any one cause as of yet. I hope that South East Asian vultures are not lost to a problem that can be easily solved with the correct education and personal choices. In this instance cattle merely serve as the vehicle for human negligence. This entry was posted in India and tagged Animal Welfare, Cattle, Diclofenac, India's Vulture Crisis, Indigenous Cattle Breeds, Parsi Religion, Tower of Silence. Bookmark the permalink. My wife and I had the opportunity to visit Mumbai a couple of years ago and did visit and learn of the Parsi religious rites and the crucial role vultures play. Sad to find out the decimation of their population and hope for a turn around. Fascinating and informative! to say that I’ve really enjoyed surfing around your blog posts. After all I will be subscribing for your feed and I’m hoping you write once more soon! Excellent post, and really good to see such a clear plea to veterinarians (and other practioners) to stop (illegally!) using diclofenac for cattle. http://www.save-vultures.org may be of interest for further reading on the efforts for vultures. Thank you for your feedback, Chris. Keep fighting the good fight for vultures and health and wellbeing of the environment they (and we) are part of. Pretty nice Kelsi! your efforts to the blogs have been great! Have read a few pages on the Indian scenario. It is very appreciative of you to be addressing these problem that still exists and have a long way before they are successfully controlled. Good luck! !